When the City Council of Honolulu passed a bill to ban single-use plastic grocery bags on Oahu in late April, leaders of the Surfrider Foundation and Sierra Club Hawaii met with the Mayor, who reassured them that he was going to pass it. True to his word, Mayor Carlisle signed the bill into law on May 11th, making Hawaii the first state in the nation where every county is covered by a plastic bag ban. This was not done by the state legislature, but instead by all four County Councils - a great example of local activists and decision-makers addressing the serious issue of plastic pollution. The City and County of Honolulu is the last of Hawaii's counties to enact a ban on plastic bags at the point of sale. 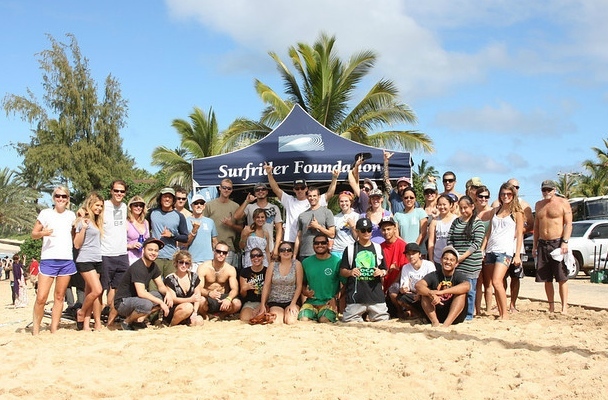 The Surfrider Chapters on Maui and Kauai counties helped pass the bans on those islands and say the results are dramatically cleaner waterways, beaches and nearshore waters. The Hilo and Kona Chapters helped pass an ordinance on the Big Island that will take effect next year, and the Oahu ban will go into effect in 2015. While we are excited that the plastic bag bans have been enacted, there has been a reported increase in paper bag use from locals. Paper bags biodegrade and don't have the same impact on wildlife, but there are still issues with any disposible product; so activists will continue pushing for a statewide fee on paper bags. As part of their statewide Rise Above Plastics (RAP) campaign, local Surfrider Chapters will also promote the reduction of all single-use plastic products and encourage people to start using their own reusable bags, bottles and plateware. After years of campaigning and creating an unstoppable coalition, it's time to celebrate this important victory that will help protect Hawaii's beautiful environment! Thanks to Leilei Joy Shih, the RAP Coordinator, for helping to lead this effort and congrats to all of the Surfrider activists, school groups, environmental organizations and engaged citizens who helped pass the ban!